Sweet potatoes are incredibly versatile in recipes. You can substitute them in any recipe that calls for squash or white potatoes. 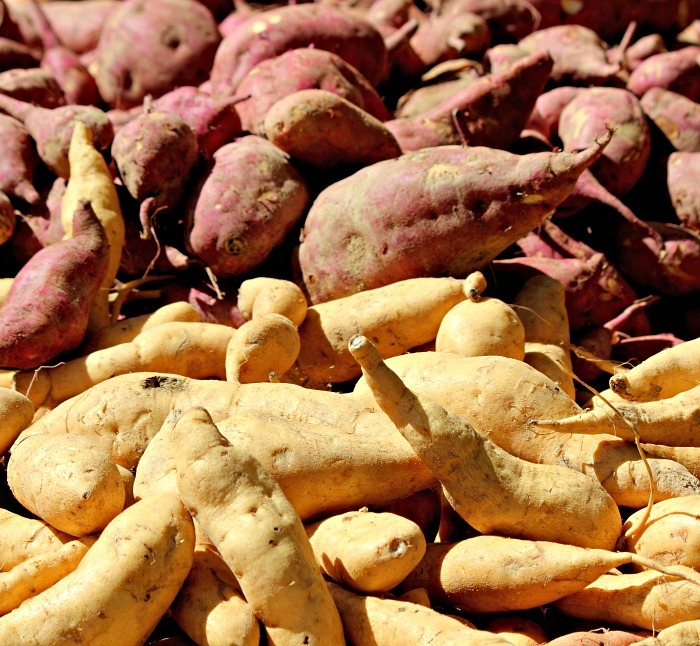 They come in many colors, not just the traditional yam style that we are so familiar with. There is even a national day devoted to sweet potatoes. It is celebrated the first Monday in April every year. The whole month of February is sweet potato month. The skins can range from white through to various shades of orange and red. They also can come with purple or brown skins. They pack a nutritious power house of energy and have a very low glycemic index which make them easier on your blood sugar. If you like starchy veggies, try sweet potatoes! 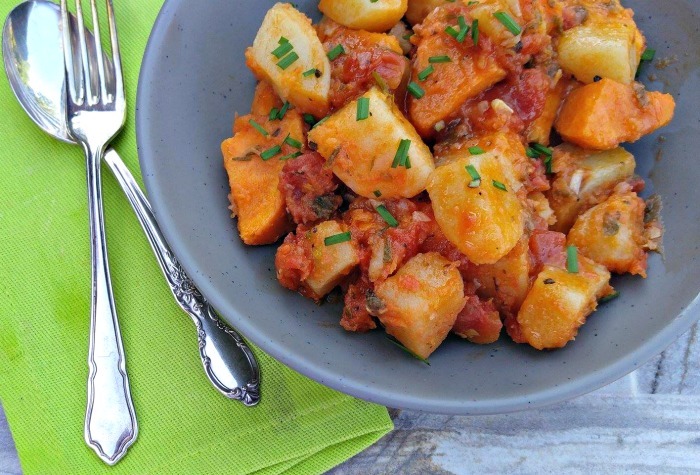 For this recipe, I used both orange sweet potatoes and normal white potatoes. 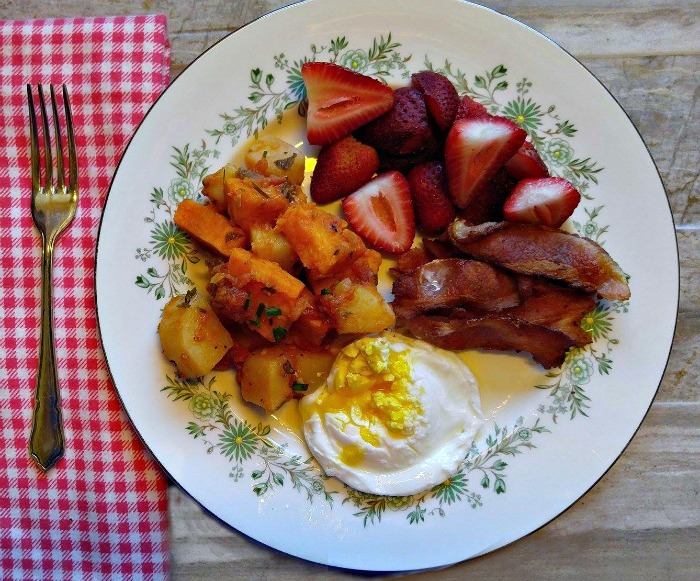 If you want to make the recipe totally Paleo, substitute the white potatoes for white sweet potatoes. The key to the flavor in this recipe is a handful of Italian fresh herbs. I used oregano, rosemary and thyme and also added some fresh chives as a garnish. 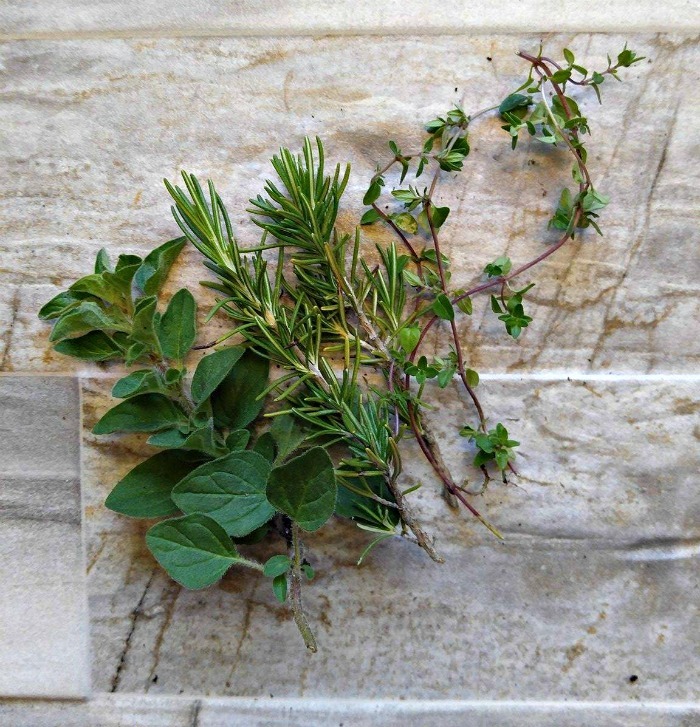 Dried herbs will work, but do yourself a favor and use fresh. They have SO MUCH MORE flavor and are very easy to grow. I keep herbs growing in pots on my deck almost all year long. Many herbs are perennials and will come back year after year. 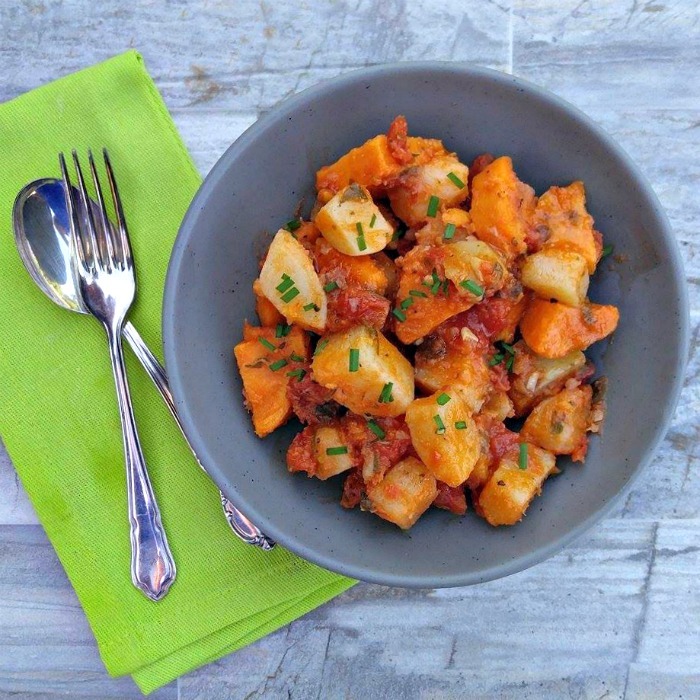 I love that this Italian sweet potatoes recipe is made all in one pot. I used a deep dutch oven. It is perfect for browning the veggies first and then cooking them on the stove top for the rest of the recipe. It’s a 30 minute side dish that is just full of flavor. The potatoes are cut into chunks and then added to olive oil in the large saucepan with some sea salt. Once they start to soften, stir in the diced tomatoes, garlic and fresh herbs and cover. Reduce the heat and they’ll be done in about 20 minutes. I stirred occasionally to make sure they didn’t stick and to incorporate the tomatoes with the potatoes and herbs. These Italian sweet potatoes have a lovely texture and they are just bursting with home grown herb flavor. Every bite of this amazing dish will have you thinking of Italy! Your family will love it and will ask for it often. It is wonderful served with Italian sausages. This dish is perfect to make in a large batch. It tastes even better the next day as leftovers! I had it with eggs and bacon the next morning and loved it! 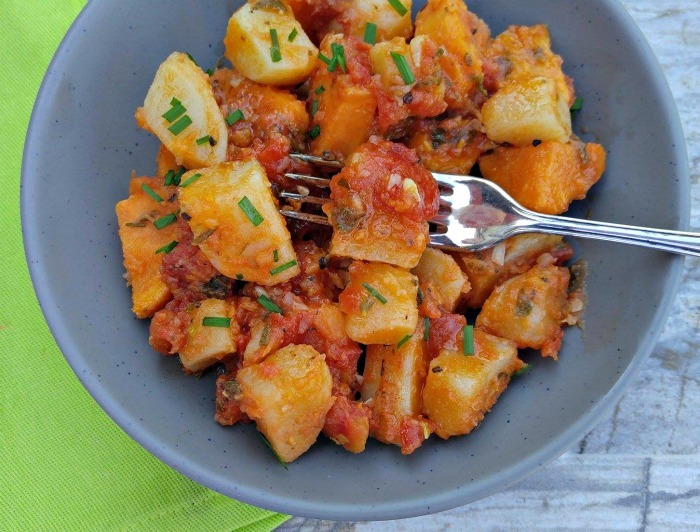 These Italian sweet potatoes combine with fresh herbs and diced tomatoes for the most amazing full flavored side dish. Heat the olive oil in a large dutch oven over medium high heat. Add the diced sweet and white potatoes and cook, stirring occasionally until the potatoes start to soften and begin to lightly stick to the bottom of the pan - about 8-10 minutes. Add the garlic, sea salt and fresh herbs and cook gently for a minute. Stir in the canned tomatoes. Reduce the heat to medium, cover and cook gently for about 20 minutes, stirring occasionally. Spoon into a serving dish and garnish with snipped fresh chives. Serve immediately. The flavors get better with time, so they make great leftovers the next day. ← Water Spout Planter – Raindrops Keep Falling on my Plants! Husband & I are trying to go vegetarian, will definitely try this.